When Stubb had departed, Ahab stood for a while leaning over the bulwarks; and then, as had been usual with him of late, calling a sailor of the watch, he sent him below for his ivory stool, and also his pipe. Lighting the pipe at the binnacle lamp [pictured, left] and planting the stool on the weather side of the deck, he sat and smoked. Note that the first part of this chapter is quite explicit. Ahab is sitting on a whale-ivory stool, and Ishmael is talking about the symbolism of Ahab sitting there. We don't have to guess that there is a symbol at play - Melville says as much. Now look at the second part of the chapter. Well, something is happening with this pipe. There is whiteness there, in the smoke, in the hair, and oh how we know white means something here; we are approaching a long discourse on whiteness. 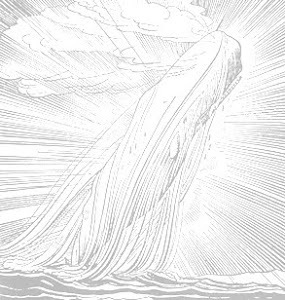 More than that, there is fire here, and Ahab will be associated with fire over and over in this book. Ahab is renouncing a firey pipe, but one he gets no pleasure from any more. He seems done with the white, the mildness, and the fire. Thers is regret in the air. Ah, now there are symbols afoot, and here Melville lets us guess! But, beyond symbols, there is a drama, a short, intense drama of a man having just had hard words with his officers looking for a smoke and a break; he is a restive, somewhat troubled man who can find no satisfaction. Ah, Thomas Mann, can you offer him a Maria Mancini? This chapter is a wonderful microcosmic read of Melville's method. It is slim, it is dramatic, and one can light one's pipe and think on it for no short period of time. After that thought, you may still not be fully satisfied - blame it on the pipe and toss it aside if you must.